This is a short course in the art of windshield repair. It is intended to illustrate the techniques used by professional windshield repair professionals and allow anyone to successfully repair their own windshield. In this introduction you will learn the basic techniques that can be followed while using economically priced kits available online and at your local automotive parts suppliers. You will also have enough information to evaluate you're your windshield and choose a kit appropriate to your repair needs. The following section covers repairs to small or round crack damage using pedestal resin delivery systems and in later sections will continue on through other type resin delivery devices and repairing long cracks. You should first become familiar with the items and method required to complete repairs on windshield damage such as bullseye cracks, star cracks and windshield chips up to 1 1/4 inches across. Understanding how to repair a windshield starts with an understanding of the construction of a windshield and what will be accomplished when using the repair methods demonstrated in this guide. 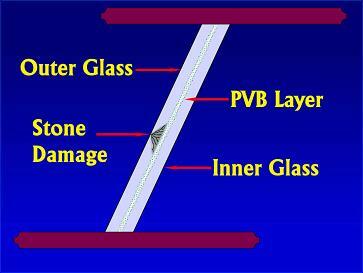 Windshields are laminated safety glass. They are made with two layers of tempered glass with a sheet of polyvinyl butyral (or PVB) plastic sandwiched in-between. Most stone damage occurs as a break in the outer layer of glass and is visible due to the air that enters the cracks or void of the break. Windshield cracks left unchecked usually continue to grow with an increased growth rate as they get larger until the crack makes its way all the way across the windshield. The object of a repair to the damage is to fill the break with resin removing the air pocket making the crack no longer visible and strengthening the glass to prevent the crack from getting any larger. Once the cracks are stabilized by the adhesion across the cracks by the polymer rosin they generally will not grow any larger. There are several options to be aware of with respect to the methods supplied with the range of kits available for windshield repair. The information in this section labeled Windshield Repair 101 is focused on making use of kits that provide a UV resin and utilize a modified syringe for resin injection. Within the course series, you will also be introduced to processes that us two part resins and Bridge type injectors. Note; you can use a two part resins or a UV activated resins with either of the two injection devices, Syringe or Bridge. There are advantages to each of the combinations of resin delivery devices and resin types. The main difference between the two types of resins is the method required to cure the resin. The two part resins have an advantage that they don't require any sunlight or UV lamps to cure. This is advantageous in that you can complete the entire process indoors, at night, in winter or summer, and bad weather is not a problem. Once the two parts of the resin has been mixed, it had a definite working time and set up time. Temperature is the primary factor that will speed up or slow the curing process.